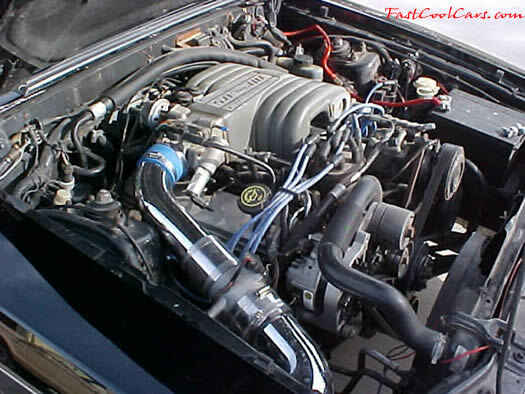 1991 Ford LX Mustang coupe - 5.0 H.O. - 5 Speed - MAC chrome cold air intake, with K&N air filter, crank under drive pulley, MAC off-road H-pipe, Dynaflow 2 chamber mufflers, aluminum drive shaft, polished 2-1/2" stainless tailpipes, posi-traction, shorty shifter. See the "Ford", "Interior", and "Wheels" pages for more pictures. Click Here to see a full custom page of pictures and listing of modifications to this LX Mustang Coupe.